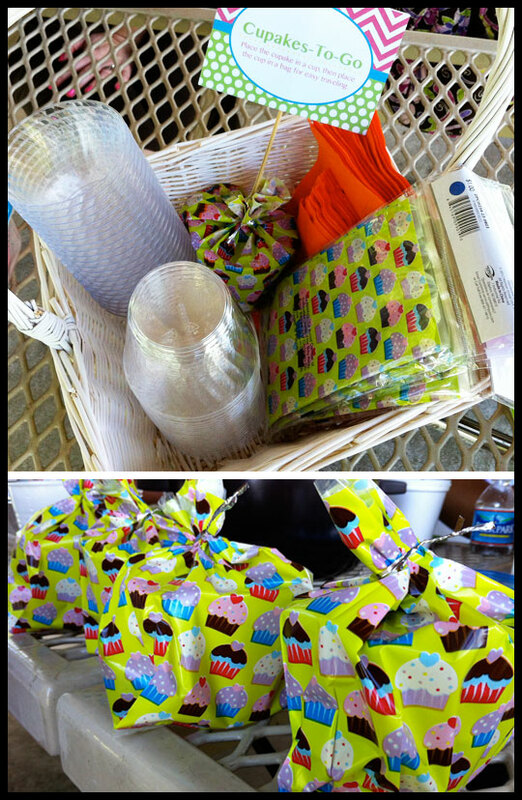 Baltimore Cupcake Picnic – Rain Rain chased the picnic away! 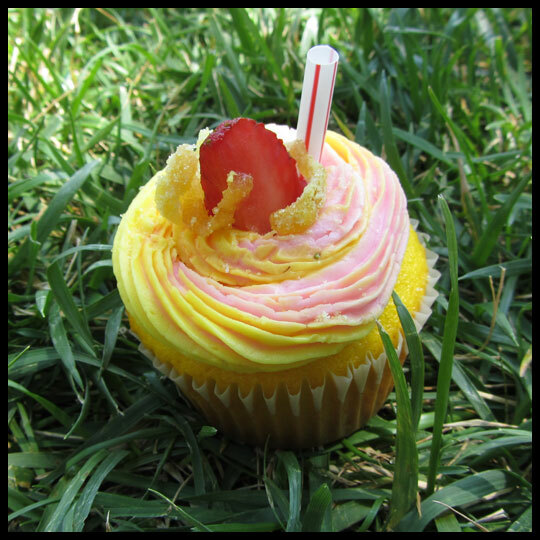 Sadly, due to inclement weather, we had to cancel our Baltimore Cupcake Picnic in Patterson Park. We were really sad the rain chased our picnic away, but luckily, for our family and very close friends, Crusader Stacy graciously opened her house so that we could gather together and share the cupcakes we’d already made. We all couldn’t help but dig in right away, especially after hearing so much about Crusader Stacy’s Nerd cupcakes! As more people showed up, we made room on the table for the cupcakes – some store bought, some homemade. It was great when the tasting was in full swing, with so many kids there, it was hard not to feel like a kid yourself, eating more sugar than necessary and maybe even getting a tummy ache. 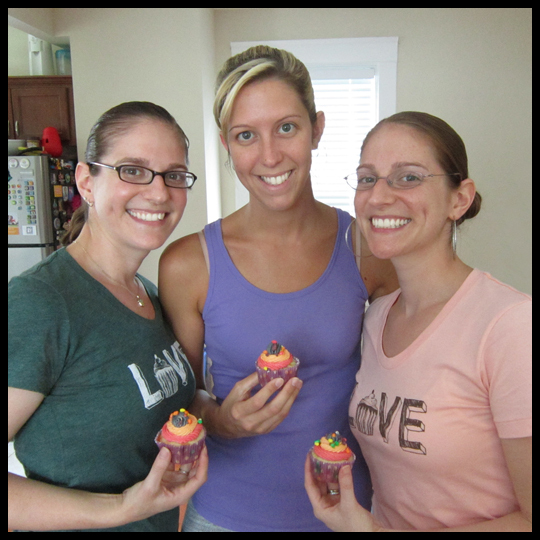 3) Crusader Stacy’s Nerds Cupcakes – keep an eye out for this recipe post! 4) Black Bottoms from a local bakery – yum! 5) Crusaders’ Dad brought four flavors of cupcakes from Sweet Hearts Patisserie, a cupcakery in Annapolis the Crusaders have been wanting to try. Watch for this review! 6) Crusader Elisa brought homemade Peach Cobbler cupcakes that Crusader Stacy had suggested on our FB page – thanks again for the suggestion! 10) Healthy Crusader Rebecca brought healthy Black Forest cupcakes – watch for this healthy recipe post coming soon. It might have been a rainy day, but we had a great time with our family and close friends. So many cupcakes, so many kiddies, so many wonderful people all in the same place! It was the perfect way to spend a rainy afternoon. The Crusaders would like to thank everyone who made it out to our picnics this summer. It’s been a great opportunity to meet our fellow cupcake lovers, try some new flavors, and spend time talking about cupcakes! Can’t wait for next summer! Sunday’s Westminster Cupcake Picnic was another successful gathering, with help from Joel of Josie’s Confections. More cupcake lovers were able to make it out to the Westminster Community Pond and the cupcakes were plentiful! We scored a great spot under the pavilion, next to the playground, which worked out well for some of our youngest attendants. Although sitting on blankets at our DC Cupcake Picnic made it really feel like an old-fashion picnic, it was nice to have the tables this time. The breeze felt great sitting in the shade. It couldn’t have been a better day for a picnic! We were admiring the cupcakes that had already shown up, but holding off digging in. It seemed like it would be more polite to wait until some of the others arrived. But then our little niece Lylah said, “I want a cupcake.” With that, the cupcaking began and didn’t stop, as more people showed up with their picnic contributions. 1) Joel brought some of his new Josie’s Confections’ boozy flavors, including Tiramisu with a Kahlua filling. Look out for a full review of Josie’s Confections coming later this week. 2) Josie’s Confections’ Mango Passion Fruit and Rum & Coke. 3) Josie’s Confections’ Ciroc Red Berry Lemonade. 4) Robin and Camille came with homemade marble cupcakes topped with chocolate ganache. 5) Beth brought an assortment from Fresh Bakery. We’ve reviewed Fresh a few times but this was the my first time tasting their Creamsicle and it had the perfect Creamsicle flavor. 6) Rachael brought her homemade Snickers cupcakes, which I also tried at her daughter’s 1st birthday and are always a hit! 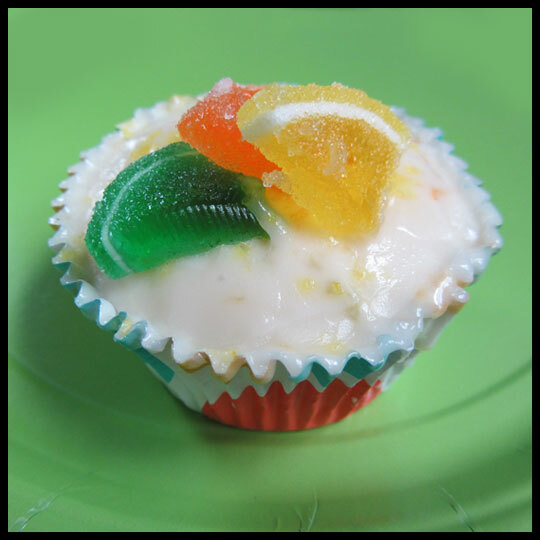 7) Crusader Elisa made Honey Grapefruit cupcakes, two ways. One had a grapefruit curd filling and the other had a honey filling. Keep an eye out for a full recipe review soon! 8) I brought these store bought cupcakes that came from Walmart. Flavors included Lemon, Vanilla Bean, and Triple Chocolate. For those curious about how these full-size Walmart cupcakes tasted, I’ll be doing a review next week. 9) Crusaders’ Dad brought Golden Snitch cake pops, extras from a Harry Potter birthday party he hosted the night before. Guest Crusader Beth was very excited to see these there! 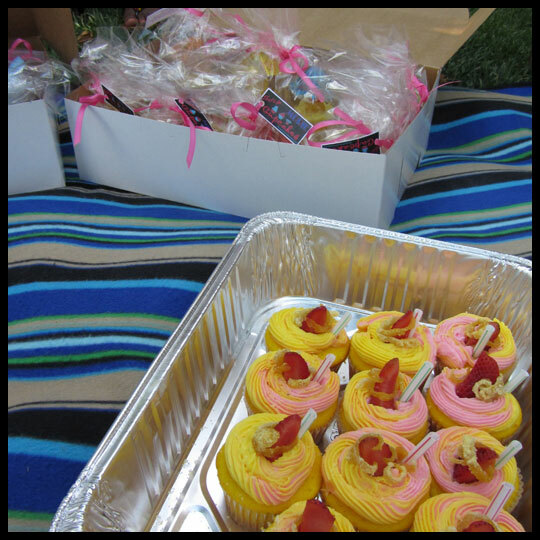 10) I think these Pink Lemonade cupcakes also came from Robin and Camille’s group. So many cupcakes, it was hard to keep track! After tasting and complimenting them, I found out that they were made with Pillsbury’s Pink Lemonade cake mix. 11) Another candy bar themed cupcake came from Guest Crusader Kim, who wrote about her first experience making these for her 30th birthday party. 12) Crusader Stacy made Lemon Blueberry cupcakes and jazzed them up for the summer with some fancy decorating. She’ll be featuring these in a post coming soon! At the last picnic we had a cupcake eating challenge and thought maybe we’d see if anyone wanted to take on “The King” and try to beat his time of 5 cupcakes in 3 minutes and 45 seconds. 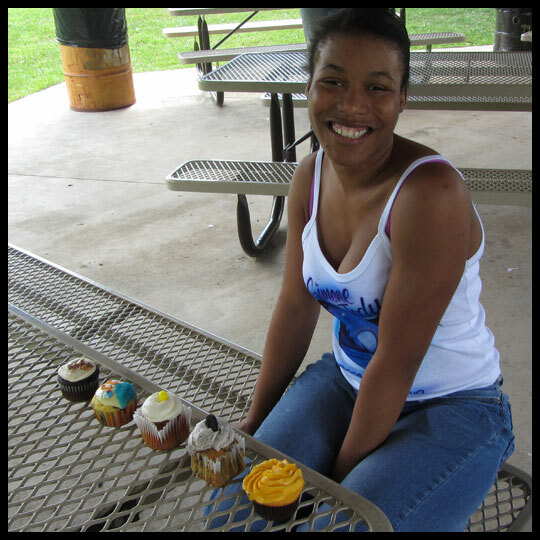 There was one brave lady, Simone, who stepped up to the plate (or in our case the picnic table…we ran out of plates that could fit all 5 cupcakes). She attacked those cupcakes with gusto, but in the end Joel gets to keep his reigning title as the real “Cupcake King.” We were very proud of Simone’s attempt and she left with a prize pack as a thank you for participating. We hope that everyone had a good time and thank our guests, especially those who drove over an hour from DC and Northern Virginia! It was great to meet other enthusiasts and enjoy the nice day talking about baking, cupcakes, and getting to know one another better. 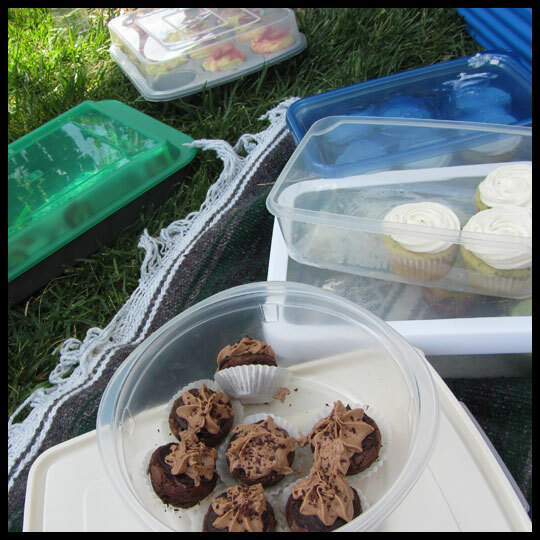 After two great Cupcake Picnics, we are even more excited for our final Baltimore picnic next month and are already getting requests to have a 2013 picnic series! If you are interested in attending the Baltimore Cupcake Picnic, check out more details and RSVP here. 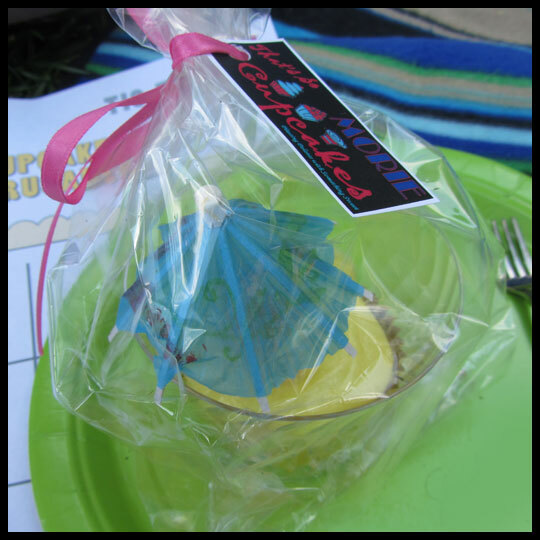 Our DC Cupcake Picnic Recap! 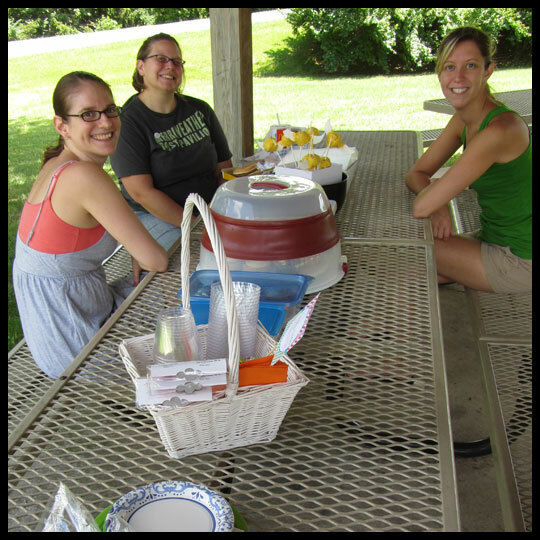 Enjoying cupcakes, relaxing in the beautiful weather, and gathering with people who share a similar interest was what our first ever cupcake picnic was all about. 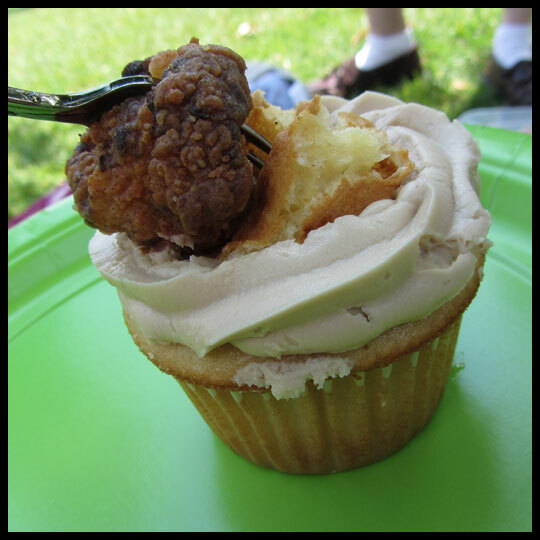 This past Saturday the Crusaders, with the help from Joel (AKA: the Cupcake King) of Josie’s Confections, organized a cupcake picnic in Georgetown Waterfront Park. It was only a small gathering but it was filled with TONS of cupcakes and good times. We were lucky enough to land a spot in the shade under a tree, and slowly everyone arrived. The group included us three Crusaders, my dad, Joel, Lamorea from That’s So Morie Cupcakes and her family, and fellow cupcake lover, Danielle, and her boyfriend. After chatting for a few minutes, it was time to dive into the cupcakes! 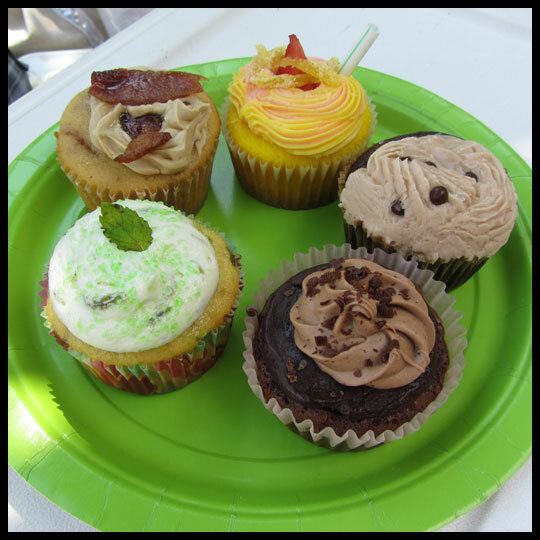 Joel, from Josie’s Confections, brought his signature Chicken N Waffle cupcake, as well as Salted Caramel minis, Strawberry Lemonade (which won the 4th place for People’s Choice at the NCACS’s Cupcake Challenge), and Maple Bacon. Lamorea, from That’s So Morie Cupcakes, brought a big assortment of cupcakes all individual wrapped up and tied with a ribbon. She came totally prepared for people to take cupcakes home with them! Among her flavors were Pina Colada, Simply Strawberry, Chocolate Chocolate, and Citrus in the City. Other cupcakes present included another Strawberry Lemonade, a variety from Red Velvet Cupcakery, an assortment from the Giant Bakery, and the Crusaders’ contributions: Mojito (me), Mocha Brownie (Jenn), and Strawberry Basil (Elisa). 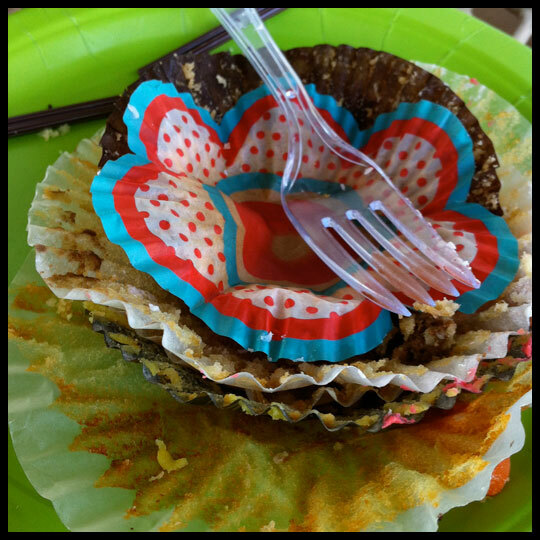 While we always enjoy eating cupcakes and chatting, the fun really started when Danielle said that she would still like the challenge of eating five cupcakes for the cupcake eating competition. She was the only one who stepped up in advance so we told her the prize was hers, but she was determined to earn her prize fair and square. 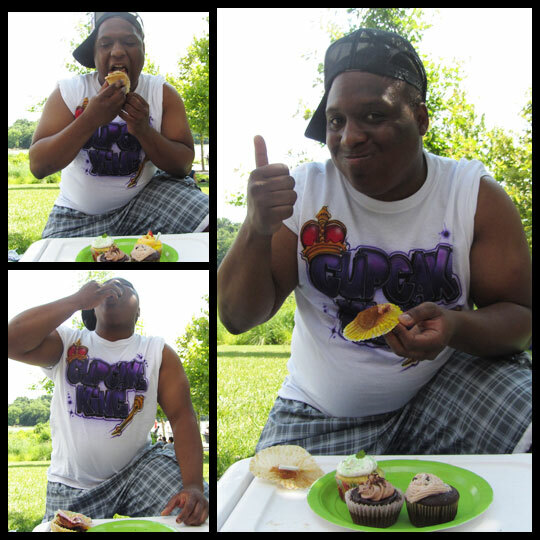 About halfway through Danielle’s challenge, the Cupcake King, Joel, decided he wanted to see what he could manage. Since he helped us put together the prize pack, he was entering the contest purely to take his title of Cupcake King to the next level. It was like witnessing an episode of Man Vs. Food in person. They both did an amazing job! Danielle put down 4.5 cupcakes is 5 minutes (at first she wasn’t focusing on her time so much, but picked up the pace as soon as Joel decided to join the fun) and Joel ate 5 cupcakes in 3 minutes and 45 seconds. He truly has earned his title, Cupcake King. 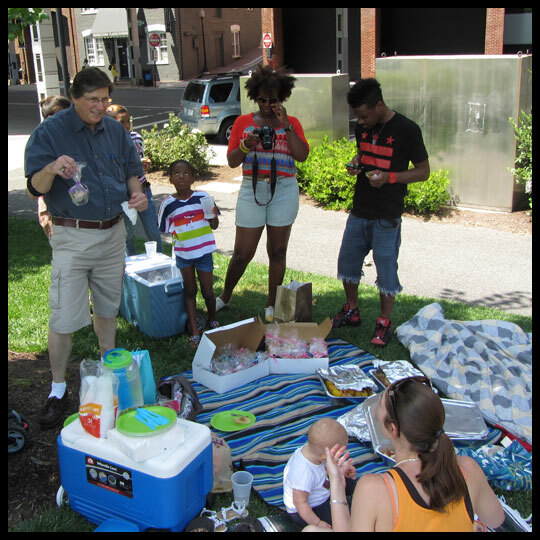 We couldn’t have asked for a better first picnic and we are really looking forward to the next two in our series. Sunday, July 29th we will be meeting at the Westminster Community Pond in Westminster, MD and on Saturday, August 25th we’ll meet in Patterson Park in Baltimore, MD. For more information click here. 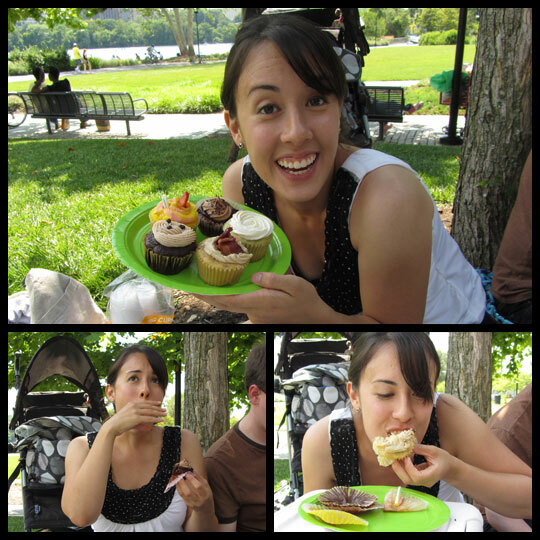 We hope you can join us and make those cupcake picnics just as memorable as this one in Georgetown Waterfront Park was! 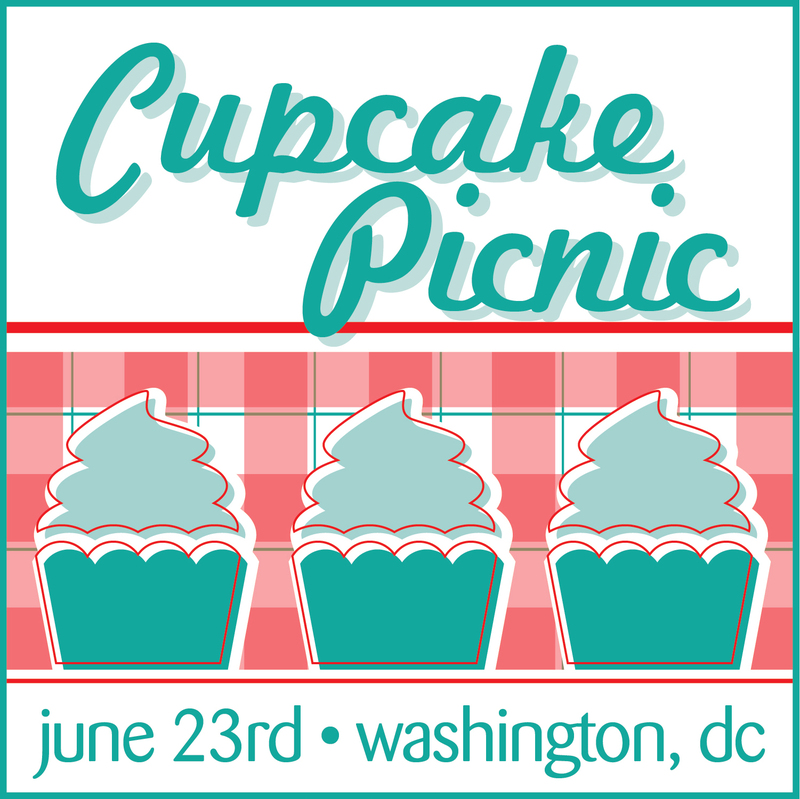 Join us for our first ever Cupcake Picnic Series! This DC Picnic at Georgetown Waterfront Park is the first in our series. 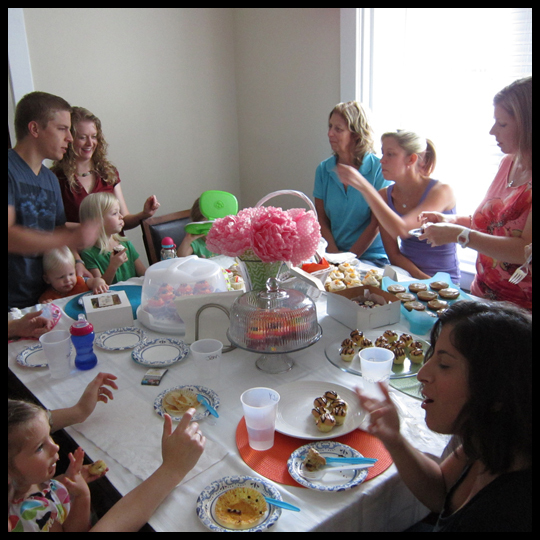 We thought it would be nice to have a fun, casual and relaxing summer gathering for cupcake lovers to gather. The only request we have is that everyone brings cupcakes and is ready to share with each other! You can bake them or buy them, that is totally your choice. We will meet inside the park directly across the Constitution Parking Garage off Wisconsin Ave NW. To see a map, click here. PLEASE RSVP and let us know if you will be bringing anyone. We want to make sure we get a head count so that if we need to move we wait for everyone to arrive. Children are welcome to join the fun too! You can RSVP by leaving a comment below, emailing us at cupcakecrusaders@gmail.com, or click here. We even have some fun events planned in conjunction with Joel from Josie’s Confections! One is a cupcake eating competition complete with a prize for the winner! We will only have enough cupcakes for up to 5 people to compete, so if you want to participate, please contact us. The first 5 people to let us know, will be our contestants! If you have any questions, please send an email to cupcakecrusaders@gmail.com. Hey Cupcake Lovers! 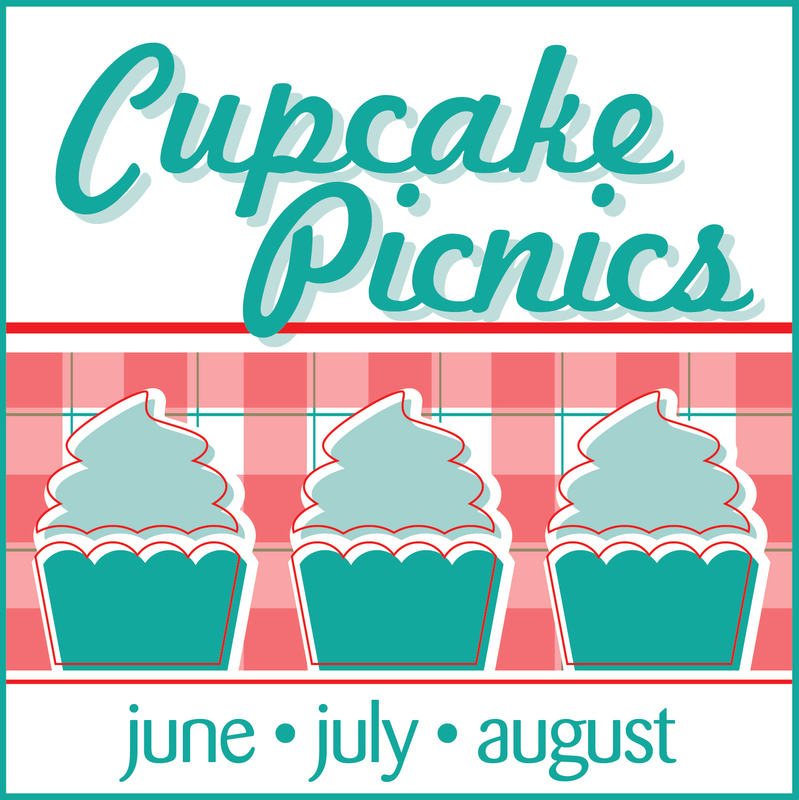 We are excited to announce that we are planning 3 cupcake picnics this summer. This is the first year we have done this, but thought it would be a good way to get to know some of you and share something we all love… CUPCAKES! We want this to be a fun, casual and relaxing summer gathering so the only request we have is that everyone brings cupcakes and is ready to share! You can bake them or buy them, that is totally your choice. We’ll be setting up in a local park for each city above and might even have some fun events planned in conjunction with Josie’s Confections. Stay tuned for more details and in the meantime, start brainstorming what you want to share! We hope to meet you all soon!